Please find official statements, photos and press releases with regards to Michelle Wilkins. Birthday: Nov 3, 1988. Background: On March 18, 2015 Michelle Wilkins answered a Craigslist ad for baby clothes. When she arrived at the seller’s home, Dynel Lane, a former nurse’s aide, attacked her, cut her open, and removed her unborn child. Wilkins survived the incident; her child did not. Michelle is at a safe and recovering needing time, privacy and healing. 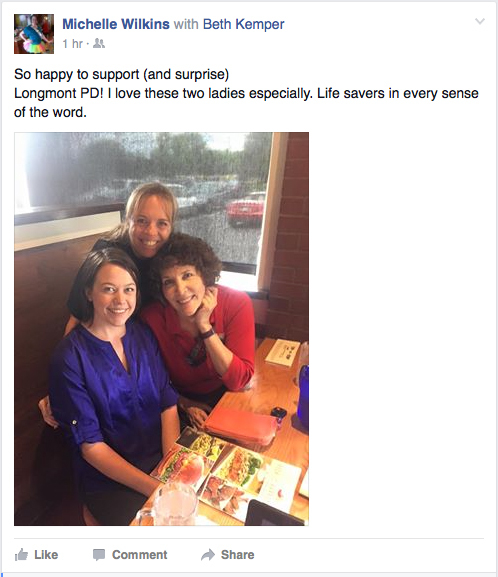 In photo: Michelle Wilkins (left); Longmont officer on the scene March 18 Christie Wheeler (middle); and 911 Operator Beth Kemper (right).